Dublin has experienced a renaissance. Today, this gracious and cosmopolitan city on the Liffey is one of Europe's premier destinations. The capital of the Republic of Ireland, Dublin is an intimate place that is easy to explore. Stroll past St. Stephen's Green or survey the gray, stone façades of Trinity College, Ireland's oldest university. The city is also remarkably well-preserved - every June 16, scholars retrace the paths of James Joyce's characters in the novel "Ulysses," set in Dublin on June 16, 1904. Dublin possesses a storied history. A settlement has existed on the banks of the River Liffey for at least a millennium and a half. Succeeding waves of Gaelic, Viking, Norman and English invaders have left their mark on the city. Built in honor of Ireland's patron saint, St. Patrick's Cathedral is the largest church in Ireland. It is said to be one of the earliest Christian sites in Ireland where St. Patrick baptized converts. Trinity College is Ireland's oldest university and one of the great universities of the world. Trinity College Library is the home to the Book of Kells. Dublin has over 1,000 pubs and several hundred types of beers. St. James's Gate Brewery, a brewery founded in 1759 in Dublin by Arthur Guinness, is today the largest brewer of stout. The Guinness Storehouse is Ireland's number one visitor attraction and tells the story of the "black stuff". Dublin Castle represents some of the oldest surviving architecture in the city, with its 13th-century record tower and State Apartments, once the residence of English viceroys. From 1185 until 1973, Malahide Castle was the home of the Talbot family. Today, it's one of the oldest and most historic castles in Ireland. 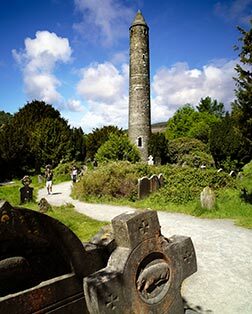 A monastery set in a spectacular natural setting, Lonely Planet Ireland calls Glendalough "truly one of the most beautiful places in Ireland and a highlight of any trip to the island." Powerscourt is set in the graceful Wicklow Mountains. As one of the most beautiful country estates in Ireland, its grounds boast the highest waterfall in Ireland. Located near Navan in County Meath, this family-owned farm is in the heart of Ireland's rich grasslands. Causey Farm raises sheep and cattle as well as a small herd of Connemara ponies.